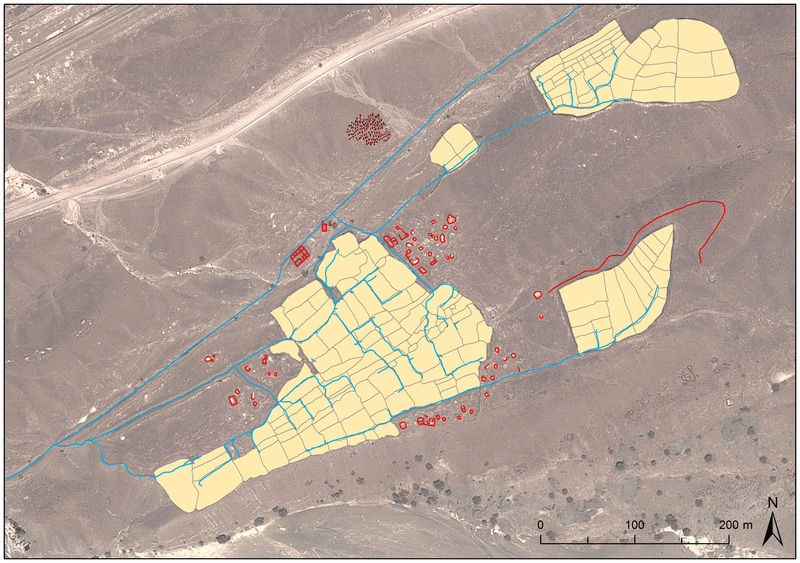 The overall aim of the Wadi al Jizzi Archaeological Project is to document the history of settlement and land use of the region in a systematic manner. Three thematic research questions structure our investigation of history of settlement and land use of the region. The first one focusses on subsistence practices, or how one obtains food in this region, and how this was affected by ecological and technological transformations of the landscape. The second is concerned with mining and metallurgy, and how this industry transformed local landscapes and societies. The third topic consists of the funerary landscape of the Wadi al Jizzi region, that is how we can best understand the tens of thousands of funerary monuments (cairns and cemeteries), and what types of societies they relate to. Like much of Oman, the Wadi al Jizzi region at present is predominantly a marginal terrain in which agriculture is only possible with irrigation technologies, by tapping into aquifers or ground water. Climate studies suggest that in the Early Holocene, prior to 4000 BC, there was more rain and water in this part of Oman, probably due to a more northerly distribution of monsoonal rains. Archaeological data suggest that for some time, towards the end of the fourth millennium BC and the start of the third millennium BC, people could still profit from relatively high water tables in optimal locations, and irrigation could be performed with relatively simple techniques. In the Wadi al Jizzi irrigation devices that fit into this picture have been documented in the form of small dams that would have retained water in a reservoir. 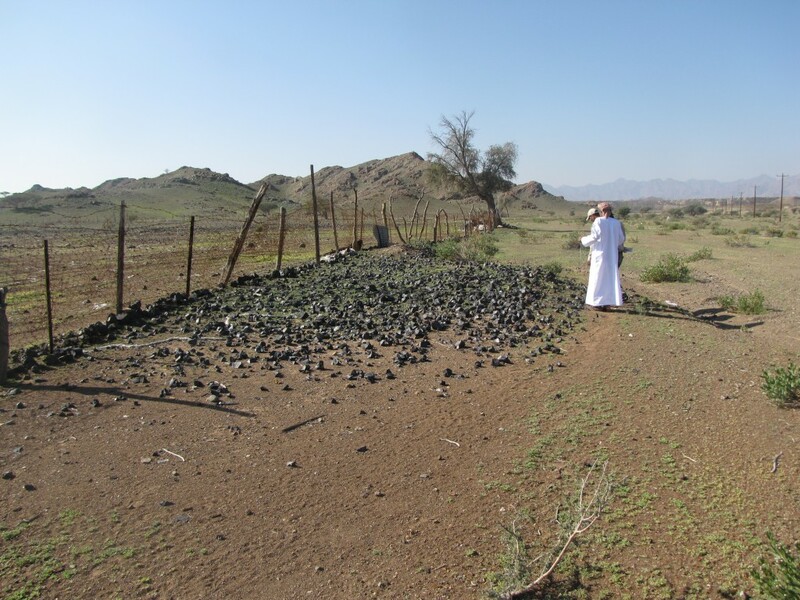 It is clear that by the Islamic period very complex ‘falaj’ type irrigation systems were constructed in Oman, which remain relatively poorly investigated. The question when exactly complex irrigation techniques, such as irrigation channels, tunnels, and animal operated water wells, were first introduced remains one of the key questions in the archaeology of Oman. While some would argue that this occurred already in the third millennium BC, most would argue for a date in the Iron Age. By far the most extensive evidence for irrigation systems in the Wadi al Jizzi region dates to the Islamic period. A large number of substantial irrigation systems appear to have been constructed in the ninth and tenth centuries AD, including the Falaj al Mutaridh, which is probably the largest irrigation system in all of Oman. While these irrigation systems have been described in very general terms, relatively little is known about them in detail: what scale farming systems and villages were along these systems, how long they were in use for, etc. To better understand these Islamic irrigation systems and how they change over time we plan to investigate them systematically. The second topic we would like to explore in WAJAP is the effects of mining (for metal ores and other resources) and metallurgy on local landscapes and societies. Copper exploitation in particular has been the subject of systematic investigations by Weisgerber. Many of the sites that Weisgerber investigated in the 1970s no longer exist today, due to modern open shaft copper mining in the same landscape. It remains to be seen how much remains of ancient mines elsewhere in our research region. One alternative source of data consists of the slags, roasting ovens, and the (fragmented) remains of smelting ovens. The most ubiquitous data take the form of slag heaps, which have a broad distribution in the region close to the copper sources. Like most of Oman the Wadi al Jizzi region is dotted with large numbers of graves of various types and sorts. In our region we can estimate their numbers in the tens of thousands. 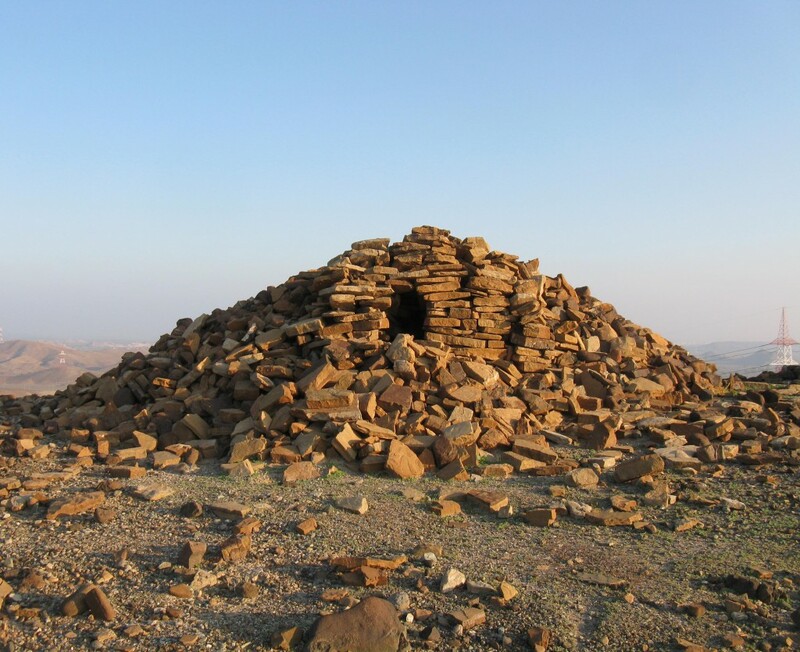 Although funerary monuments have been the topic of many projects in Oman, the focus has been predominantly on large collective burial tombs dating to the Hafit and Umm an Nar periods, as well as some Wadi Suq graves. The systematic investigation of the funerary monuments in a region, in order to establish the variability in types, location, patterning between tombs, and dating, has been rather limited. Through such research we can contribute to discussions about the nature of the associated societies: whether they were constructed by pastoral groups moving through the landscape or sedentary populations living in the regions. In January 2012 we have documented some 400 cairns, which had been pre-plotted from Google Earth, and we aim to continue this line of work in the coming seasons. We are also looking at ways of expanding our documentation of these features, by using photogrammetric software that will allow us to document these features in 3D. In our first campaign we have already documented a considerable range of types in our survey of graves features. One of these types consists of horseshoeshaped terraced cairns and occurs with substantial amounts of turquoise glazed pottery, metal objects, and fragments of glass vessels. These cairns date somewhere in the first millennium AD, but their exact chronology needs to be clarified through future research. 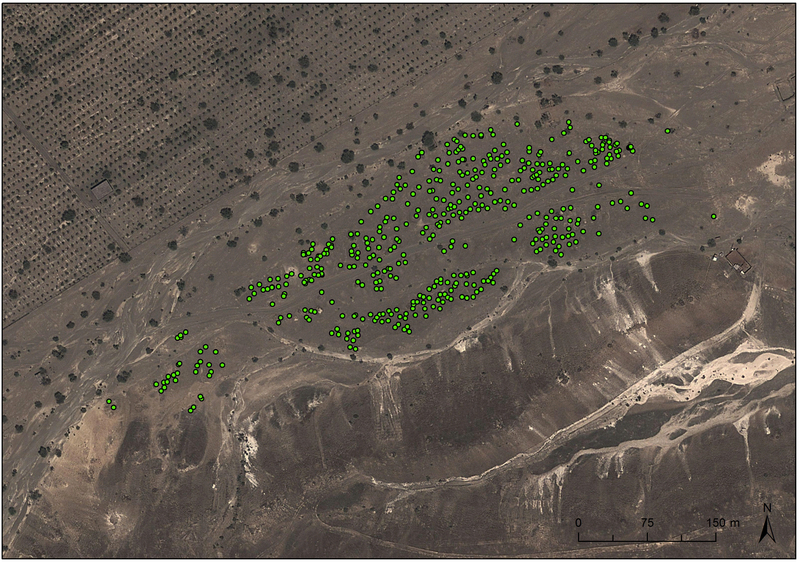 We also documented a large Wadi Suq cemetery in 2014 (early second millennium BC), which had been previously investigated by Frifelt in the 1970s. By investigating the funerary monuments the Wadi al Jizzi Archaeological Project hopes to gain a fuller insight into the types of societies that lived and buried their dead in the Wadi al Jizzi region, and how these change over time.